SHERPA RIGGER BOOT. 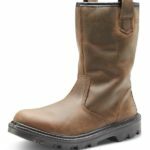 Brown rigger fur lined boot. Sherpa PU Rubber. 200 Joule steel toe cap and midsole. Shock absorber heel. Anti-slip and anti-static. Sole resistant to oil, acids and alkalis. Heat resistant to 300?. Waxed nubuck leather upper. Water resistant leather upper. Cold insulating. Conforms to EN345 S3. Dunlop Purofort Rig Air F..
Safety Category : SB. Marking Code : P. Features : Midsole. Toe Protection. Waterproof. Description : Lined rigger. PVC/Nitrile sole. Please contact us on 021 4705088 or sales@atozsafetycentre.ie for more details. 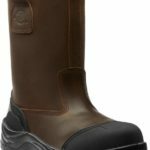 STEELITE RIGGER BOOT S1P ..
Popular style rigger boot with outstanding protective features such as steel toecap and midsole. Oil, fuel and 300⁰C heat resistant outsole. Unlined for warm conditions. 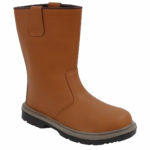 Durable and comfortable, ideal for road workers. SRB SHERPA DUAL DENSITY P.. 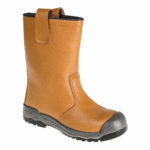 The Dickies Stafford Unlined Rigger is a high quality rigger boot with multiple features. 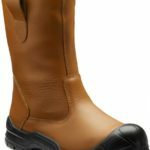 Composite protection in the toe-cap & midsole areas provides all round safety, whilst the exclusive sole units are SRC slip resistant as well as benefitting from fuel, oil & heat resistance. Large anti-scuff protective areas feature on the heels and toes to help protect these high wear areas even further. A great addition to the Dickies footwear collection. The Dixon Rigger is a 2017 update to our previously popular rigger boots. 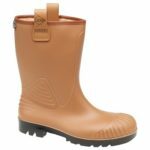 This unlined version has a water resistant leather upper and benefits from an SRC rated slip resistant sole unit, which is our exclusive DTI sole. The protection is provided with steel in the toe-caps & midsoles for underfoot protection.